Bred by Crabbet Park Stud imported in 1926 by W. K. Kellogg, Pomona, California. There is no question but that *Raseyn was one of the most popular and influential Crabbet stallions ever brought to the United States. *Raseyn jumping, rider unidentified. As a young horse, probably about 4 years of age. He was a very classic horse with great appeal and he was an outstanding sire of unusual prepotency. Several Crabbet oriented breeding programs have utilized this blood, as well as many very different breeding programs, widely scattered, with quite dissimilar goals. Some of the breeding plans using *Raseyn blood have inbred heavily to him (this began, in a few cases, even during his own lifetime), while others have preferred smaller more or less “single shots” of the particular qualities *Raseyn offered. However, his blood is so widely disseminated that today some breeders use his descendants somewhat incidentally just because *Raseyn happens to be in the pedigrees of animals selected for other considerations. By pedigree, *Raseyn was actually 50% Polish, 25% Ali Pasha Sherif, and 25% the Blunts own desert breeding. *Raseyn as a young horse soon after his arrival in the United States from England, age 3 or 4 years. Photo taken in the stable parking lot at the old Kellogg Ranch, Pomona, California. 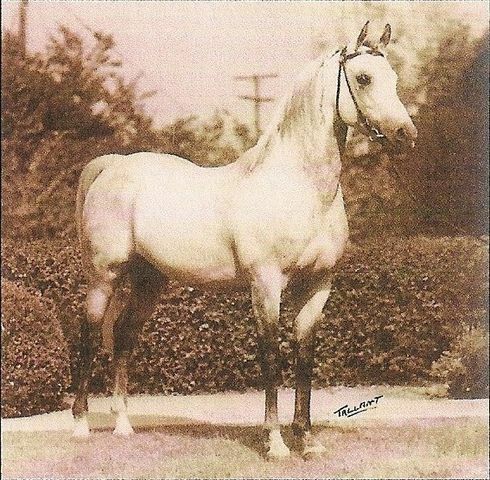 *Raseyn’s sire, the gray Skowronek, foaled in 1908, and bred by Antoniny Stud, Poland, was one of the greatest sires the Arabian breed has known. Indeed, some of the close-bred breeding programs in which *Raseyn participated were actually designed with Skowronek as the focus, rather than *Raseyn. Skowronek’s reputation as a sire was made by his brilliant success at Crabbet under the direction of Lady Wentworth. 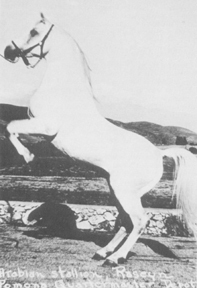 While Skowronek was acclaimed for his wonderful head and neck qualities, he absolutely excelled in his back, loins, pelvic structure, hip, croup, and hind leg perfection, and these latter were all areas where many Arabians, including those at Crabbet, needed improvement. Skowronek thus proved beyond value in this respect, as well as in the matter of passing on exquisite classic type. Including *Raseyn, a total of 27 Skowronek sons and daughters are in the background of American Arabian pedigrees. 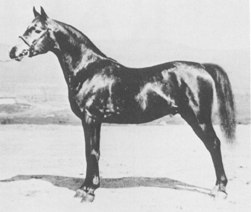 Ibrahim, sire of Skowronek, was a gray desert bred horse foaled in 1899 and taken to Poland at the age of 8. He was killed by the Bolsheviks in 1917 at the age of 18. He was a smooth horse with excellent bone and good strong legs; he is further said to have been a quiet and kind individual. His sire and dam were both desert Arabs; his dam’s designated name is probably a corrupted translation referring to her strain name, Seglawi Faliti. Jaskolka, dam of Skowronek, represented some of the finest and oldest Polish lines of her day; her dam line traces on the bottom to the Kehilan Ajuz desert mare Iliniecka, taken to Poland in 1820. 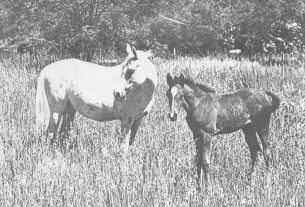 Jaskolka, a gray, was foaled in 1891. *Raseyn’s dam Rayya was the product of one of Crabbet’s favorite linebreeding formulas to Mesaoud – a Mesaoud daughter to a Mesaoud grandson; Rayya’s sire and dam were also of the same dam line. Rayya’s sire Rustem, a brown stallion foaled in 1908, was one of Wilfrid Blunt’s favorite horses; after his successful Crabbet career he was sold to Egypt in 1920, where he also had important influence. Rustem’s sire, *Astraled, another brown, was foaled in 1900 and came to the United States in 1909; he was certainly a very important sire. He was also noted for his trot, as was his dam, the brown Queen of Sheba. Chestnut *Rose of Sharon was a mare of outstanding quality and phenomenal influence; Ridaa, chestnut and foaled in 1892, was her most important daughter. Rayya’s dam, Riada, yet another brown in *Raseyn’s pedigree, was foaled in 1904. She is said to have been a beautiful mare with a lovely head and good disposition. As we learned in the *Nasik article I wrote for this magazine, Mesaoud was the most important sire influence at Crabbet up to the advent of Skowronek, and Rodania was the most important foundation mare in England – and one of the most important in the world. With this illustrious pedigree background, one might naturally expect the brown Rayya, foaled in 1915, to have been an individual of very real quality. Stangely, she was just the opposite – a shockingly poor mare. It is nothing short of amazing that she managed to somehow produce a horse of the caliber of the great *Raseyn who bred on so consistently, strongly, and well, with such beneficial positive influence. This must have been one of those rare cases where pedigree (Rayya’s) did come through with hidden (in her phenotype) good genetic material, and it belies the oft-heard but nonfactual cliche that good stallions never have poor dams. Conversely another school of thought has it that good pedigrees will win out in breeding (as with Rayya) even if poor individuals are bred from, but in real life this doesn’t seem to be true with any more consistency than the cliché about good stallions always having good dams. How could Rayya have been so awful when she was so well bred? Well, this happens sometimes (more often than many people will admit) because of the extreme complexity of the countless genetic combinations possible – a certain amount of randomness is always present, even in extremely inbred animals. No breeding dogma is ever totally consistent. The only source of Rayya blood in American pedigrees is through *Raseyn. 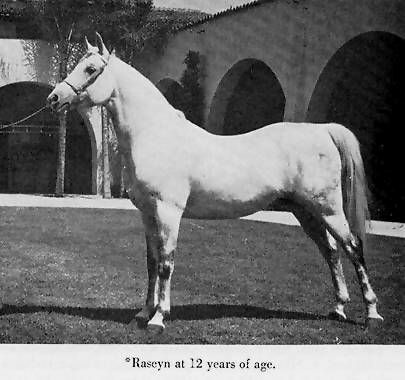 *Raseyn came to America as a 3 year old, in 1926, imported by W K. Kellogg of Pomona, California. 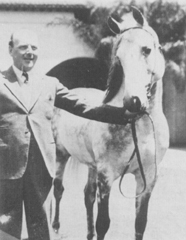 In early 1925 Will K. Kellogg, the breakfast food magnate, founded his extremely influential Arabian stud. To stock it he made his first purchase, of eleven animals, from C.D. Clarke, Indio, California, on March 25, 1925; the price averaged about $1636 per horse. Carl Schmidt, who was caretaker of the Clarke Arabs, went with them to Pomona and became the manager of Mr. Kellogg’s ranch. Six more Arabs were purchased on December 1, 1925, from F. E. Lewis II, Spadra, California. All of these animals represented the pooled genetic resources to be found in America at that time, with Davenport breeding being the overwhelming influence among them. Some of these horses were, indeed, fine Arabians. For additional foundation stock, Mr. Schmidt, who had traveled widely, including prolonged trips to the desert Arab breeding countries, suggested that Mr. Kellogg send him abroad on a horse buying expedition. Accordingly, Schmidt arrived in England the end of January 1926 and visited Crabbet on the 28th. It was decided that Mr. Kellogg would buy his Arabs there and so the idea of Schmidt journeying on elsewhere was dropped. Fourteen Arabs were acquired from Lady Wentworth for a total price of about $83,000, which averaged out to some $5930 each. However, the two mature stallions, *Nasik 604 and *Raswan 607, were apparently gifts from Lady Wentworth; if they are subtracted from the total of fourteen we are left with twelve animals among which to divide the $83,000 – an individual price average of about $6900. Another choice of price appears when we consider that three of the mares foaled after their arrival in California, bringing the importation total up to seventeen, or a price average of $4882. These fourteen Arabs, together with the registered Welsh Pony stallion, *Kilhendre Celtic Silverlight, who was Lady Wentworth’s gift to Mrs. Kellogg, left Crabbet the morning of March 26. The animals were walked the three miles to Three Bridges railway station where they boarded the train for the trip to the London docks. *Raseyn unloaded from the train quietly, but finding himself one of the last to go aboard ship became quite worried. His handler managed to reassure him and got him to walk up the 35 foot gangplank to board the Minnewaska. The horses were placed in large padded crates. They arrived in New York City April 5th and that same evening left by train for California, arriving on April 10th. *Raseyn racking, Charles Smith up. Photo taken in the stable patio, W. K. Kellogg Arabian Horse Ranch. Apparently immediately after his arrival at the Kellogg Ranch, *Raseyn was worked excessively hard for a 3 year old – he reportedly was made to carry some 245 pounds frequently on long, rough hill rides. H.H. Reese, who replaced Schmidt as ranch manager on January 1, 1927, found on his arrival that *Raseyn was “shaky” in the forelegs and over at the knees. Total rest, with free corral exercise, corrected the condition in a few months and *Raseyn got over his soreness and went sound again. In his very old age *Raseyn once more went over at the knees. One wonders if this early trauma, from which he seemed to recover entirely, really did lasting damage to him. However, *Raseyn took well to saddle work and by 1927, when he was 4, he was being used for jumping, which he seemed to enjoy, and which did not bother his recovered front legs. That year his training took him to the point of going over hurdles three feet high. *Raseyn and Charles A. Smith. Photo taken in the stable patio of the W. K. Kellogg Ranch. *Raseyn had the unusual trait, for an Arab, of having a born-in natural amble (which he passed on sparingly to some of his get). Later it was therefore a relatively simple task for trainer Charles A. Smith to teach him to convert this amble into two different artificial gaits – the slow-gait and the much faster rack. *Raseyn was shown for some years, then, by Mr. Smith, in the famous Kellogg Sunday afternoon exhibitions, as a five-gaited saddle horse. His presentations were very creditable and correct; as a result many people came to believe that *Raseyn had particularly good action. The truth is that he normally had only average action, although his trot was very correct, and the extra action was gained by the use of moderately long toes and whatever inspiration *Raseyn may have gotten from wearing protective racking boots. (No other aids to action were ever used and *Raseyn was definitely never gimmicked as our modern “park” Arabs are; he was never made to do all the unidentifiable grotesque gyrations they do today. Rather, *Raseyn did an old fashioned, honest, and pure five-gaited routine – flat footed walk, square trot, classic slow-gait, and classic rack.) 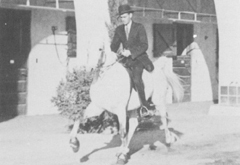 Mr. Smith, who came to the Kellogg Ranch in 1929 and stayed 30 years, until his death in 1959, trained, drove, and rode all the famous Kellogg horses shown in formal or pleasure English style. He always said *Raseyn was the laziest horse he ever rode, and the hardest from which to get a good work *Raseyn always preferred the easiest, most energy conserving way to do a task. Other facets of *Raseyn’s personality and temperament were interesting too. He was a cool, level-headed horse, not easily upset. He took most things in stride and never shied. However, he was much addicted to the habit of nipping. He knew better, and always controlled this impulse when being handled or worked (to the point where he was unfailingly safe and reliable with even novices handling or riding him), but sometimes, in other circumstances, he could not resist. This horse, who never had a mean thought in his head, simply could not grasp the fact that nips, which probably served him well when playing with his peers as a youngster, are too rough for people and can hurt them. However it was, *Raseyn did injure a ranch night watchman who was checking him in his stall; *Raseyn got his ear. It was a terrible accident. This nipping trait was passed on by *Raseyn to a few of his sons, but other sons did not inherit it at all. For instance, the sober minded and amiable Courier never once in his life ever dreamed of doing such a thing. *Raseyn in 1933, at age 10, with Count Alfred Potocki of Poland. It was Count Potocki’s uncle, Count Joseph Potocki, who bred Skowronek at his Antoniny Stud. Photo taken in the patio of the Kellogg stables. Besides the vocations already mentioned, *Raseyn was entered in many horse shows where he did well in both halter and ridden classes. In 1929 artist Annette St. Gaudens came to Kellogg’s and used *Raseyn as her model for a very fine and true-to-life sculpture. For at least 30 years a copy of this work was on display in the Kellogg Ranch office. Movie stars and other celebrities posed for publicity photos with *Raseyn, he participated in the famed Pasadena, California, Tournament of Roses Parade, and he appeared in two Hollywood movies. The first was Beau Ideal, filmed in Yuma, Arizona, in 1930, and the second, in 1934, was The Scarlet Empress, a story about Catherine the Great. When he arrived in the United States the young *Raseyn was such a dark gray as to be almost black – he had only begun to gray on his face, which was marked with a small star (his only marking). Later he developed especially beautiful dappling. In his old age he became fleabitten. He had an unusual natural lustrous sheen to his coat his whole life; as he turned lighter with age this became a silvery shimmer. 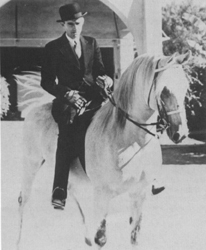 As an individual, *Raseyn did not have the elegance or reachiness of the oldest stallion in this importation, *Nasik, nor did he have the mature bloom of the only other mature stallion *Raswan. That did come later, however, and *Raseyn’s quality was immediately apparent. He was a very beautiful and classic horse. He had a short, clean, wedge shaped head, very broad between the eyes, and with a small muzzle. His forehead was flat (no jibbah) but his profile was not straight because he had a slight dish and a very delicate, fine shape to the nasal bone. He had large, dark eyes and well placed, finely shaped, sharp ears that he used quite smartly. His neck was not quite as long as one might wish, but it was well shaped – dry, arched, and clean in the throat. He used his neck beautifully. His shoulders have been criticized as having been rather straight, but they measure a correct 45° in all his many conformation photos; rather than being straight, they seem to have been a little short (not deep enough, nor laid back enough), and this impression is increased due to the flatness of his withers. *Raseyn was a trifle long in the back; in his old age this became more apparent, especially as he then also got a little low in the back. He had an especially good strong hindquarter with a correct square pelvic structure and a well set and gaily carried tail. He had good width in the chest. In the leg department, *Raseyn had broad, flat bone, lovely large joints, and from the side view his legs were admirably straight and correct, front and rear. He had long forearms and gaskins, short cannons, and especially good hocks. From the front view he was just slightly off-set in the cannons. He was well muscled throughout, including in the legs. He had an absolutely correct, square way of going. At full maturity *Raseyn stood 14-1/2 hands. Overall, he was a horse of rare merit, and he stamped his get strongly with his quality and type. *RASEYN in 1947, at age 24, wearing the Egyptian dancing horse tack. Taken in the patio of the Kellogg stables by the author. I’m sorry for the poor quality of this picture, but when I took it, at the age of 15, I was just starting to photograph horses. Readers will note his fine qualities and excellent legs. During his life *Raseyn got 55 sons and 80 daughters (41% colts and 59% fillies). His youngsters could always be easily identified when in pasture with other sucklings because *Raseyn’s were consistently the most wooly and fluffy in their original baby hair. Four of *Raseyn’s get were exported; daughters Donazetta (to the Dominican Republic) and Nareyna (to the Philippines) and sons Raadeyn (to Mexico) and Raideyn (to India). *Raseyn’s lovely, sweet tempered daughter Moneyna became famous and widely beloved for her lifelong use as a saddle horse – without ever a bridle or any other sort of headgear, and not even anything on her neck. Not only did Moneyna do ring work, including figure 8s, quite well, but she also did just as well on the trail, in parades, and etc. All this was done entirely with voice commands and messages through her mane. Her lifelong owner, Harvey Ellis, bought her from Kellogg’s when she was about six months old. Mr. Ellis, who was her rider and trainer, had one artificial leg. Moneyna could also be let out of her stall at horse shows, free, told to go to her trailer and get in, and she would do so. 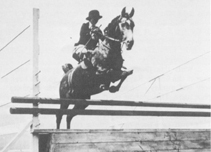 I rode, for some years, *Raseyn’s daughter Sheeyn sidesaddle in the Kellogg Sunday afternoon exhibitions. Years before that *Raseyn’s son Ralet was a star attraction in these same shows where he gave a fine exhibition of liberty jumping. An outstanding sculpture of him in this role was done by Gladys Brown (later Mrs. Edwards). For several years the beautiful Ralet was also the favorite saddle horse of my father, Dudley Woodbridge. Ralet inherited his sire’s natural ability to amble and would either trot or amble on direction of his rider. He was a sensible, unflappable horse of great dependability; it is interesting to mention that he did not inherit his sire’s nipping tendencies. Some of *Raseyn’s sons were crack winning or working stock horses, such as, for instance, Raslet, Shereyn, Serifh, and Courier; the latter was also a fine three-gaited horse, having inherited outstanding action from his dam. Ferseyn, *Raseyn’s most famous breeding son. *Raseyn’s most famous breeding son was Ferseyn. For many years Ferseyn was one of the three leading Arabian sires in America; he was without question a great horse. For most of his life he was owned by H.H. Reese, the former manager of the Kellogg Ranch. Other well known *Raseyn sons were Sureyn (who got a large ratio of champions), Ronek (well known for his action at the trot, inherited from his dam, and for his performances as a five-gaited Arab – he inherited *Raseyn’s natural amble, and in turn passed it on to his son Alyf, who became chief sire at the Kellogg Ranch and was my favorite personal saddle horse, as well as a brilliant formal driving and three-gaited performer), Gamhuri, Daareyn, Rasakkla, Pomona Ahmen, Abu Raseyn, Courier, Ibn Raseyn, Karonek, Rabol, and Rastol. In his very old age *Raseyn continued to be a major attraction in the, by then, world famous Kellogg shows. He had developed arthritis in his knees and pasterns and walked slowly, but with great dignity. He was led before the audiences wearing beautiful, authentic Egyptian dancing horse tack, all hand made in blue and gold with brass, and Charles “Shorty” Satterthwaite, his handler of many years, dressed as an Arab. My sister, L. Marian Robbins, was at that time a stenographer at the Kellogg Ranch and one of two narrators for the shows, alternating every other week with Gene Roth. Marian hit upon the idea of using Ravel’s Bolero as the music backdrop as *Raseyn made his round of the ring. This eastern/Arabic sounding music, with its strong, soul stirring rhythm, accompanying such a very impressive, proud, and noble old stallion, made an unforgettable and extremely moving emotional imprint on all who saw this presentation. *Raseyn as an aged horse. This photo, snapped in the Kellogg stable parking lot, was taken by an unidentified U.S. Army photographer and was used as one of the post cards for sale at the Kellogg Sunday afternoon exhibitions. The 1948 breeding season found *Raseyn sterile – one wonders if the pain and effects of his arthritis had anything to do with this condition. He was 25 years old, and the future of the Kellogg Ranch was uncertain. It was still in the hands of the U.S. Army, but a transfer to the U.S. Department of Agriculture was soon to take place. The Army decided to put *Raseyn down. Somehow Mrs. Alice Payne (who had an inbred Skowronek breeding program) heard of this and rushed to save the horse from death. Instead of destroying him, she managed to persuade the Army to give *Raseyn to her. He remained with Mrs. Payne some four years, until his death on May 19, 1952, at the age of 29. Mrs. Payne had to have him put down then because he had a stroke.